The United Kingdom is a country that seems full of rules and etiquette that are eternal stumbling blocks for the new expat. Most Britons are fairly understanding that an expat isn’t going to know all the rules so relax, they’ll think you’re interesting for being different! However, the dinner party is a place where some expats feel extra anxieties so below are a few quick tips to get you through the evening. Usual summer dinner party clothes for men and women are nice jeans and nice shirt for him, linen trousers and nice top/blouse for her. Winter, not much different, except wool trousers for her. He might wear trousers if they don’t know the hosts very well. This also goes for the theatre and shows unless it is an exceptionally special occasion. If the invitation says Black Tie, they mean tuxedo (no tails) for men and a cocktail dress for women. Weddings are generally somewhere between smart casual and black tie: suits for men (with or without ties), pretty dresses or trouser suits for women (more frivolous colours than office clothes). Hats used to be essential for women at an English wedding, now they’re optional. Bring a gift such as chocolates, wine, flowers (never strong smelling flowers), a small present from home, or other small gift for the hosts. Anything too expensive or large will embarrass the hosts. Never expect the hosts to open your food gift on the evening, as it may not work well with their plans. Do not be disappointed if the hosts don’t display the flowers immediately. Flowers take time to sort out and if the hosts are cooking and greeting guests this can disrupt the evening. Certainly never expect the hosts to open your wine as they may have planned their wine and their food carefully. These are gifts for the hosts, not gifts for the whole dinner party. If you would like to share something with everyone on the evening either have your own dinner party or speak with the hosts in advance with your request so they can accommodate it. Try to not get too annoyed when the jerk that always seems to be at one of these dinners starts complaining about people or politics from your country. Equally, keep your ‘humorous anecdotes’ to your self about their country, unless the stories are about you doing something embarrassing in the host country because of your misunderstanding. The Britons love self-deprecating humour. Humor doesn’t always translate (even if you speak more or less the same language) so tread carefully with people you don’t know. No one likes to be told his or her country is rubbish. What if you really don’t like the food? Unless you are allergic (it was up to you to inform the hosts in advance) or you have another good reason why it will make you ill, you should eat it anyway. If you are such a picky eater that you worry you might not enjoy the food, then don’t accept any dinner invitations! Send a thank you note to hosts afterwards. This might sound old fashioned or a lot of extra work, but it is greatly appreciated. If you have been staying the whole weekend in their home, send a bouquet of flowers or a nice bottle of wine or similar with your thank you note. Try to go to a few before you host your own. This will help you understand the usual expectations. However, don’t be afraid of being different—your guests will expect you to do things differently. Prepare some good dishes from home for locals when they come for dinner. If you are American, bring American measuring cups/spoons. Buy a set of kitchen scales to help with British cookbooks. Bookmark or print out a temperature conversion chart. If you’re American, Halloween, Thanksgiving, and 4th of July can be turned into themed dinner parties for your local guests. If your guests bring flowers put flowers in water in the kitchen so they don’t die through the evening, but you don’t need to immediately arrange them and set them out. It will interrupt your hosting and can wait for later. If the guests bring wine you don’t need to serve it that night—unless requested by the giver, although this is highly unusual. Chocolates also do not be opened but as they go nicely with after dinner coffees and teas, it might be nice to use them then (unless you have special chocolates you have already planned on using). Eight allows for continuous conversation and is less trouble for the hosts. Six is fine too, but four is awkward unless you are out at a restaurant rather than hosting at home. Even numbers are always easiest, but not necessary. Don’t panic about feeding six or eight, but make sure you practice preparing your full meal (for the number to be served) at least once before the night. Really. If you have limited space or limited cooking ability then invite several people to a restaurant. Smaller numbers are easier to manage in this case (and less expensive). 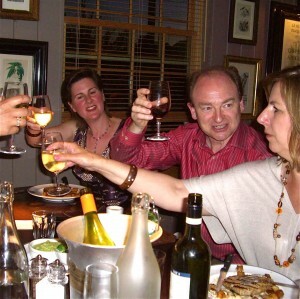 In most households in the UK alcohol is offered at a dinner party. As people arrive wine, beer or often a gin and tonic are offered (with ice and lemon). With the meal offer wine and beer, as well as soft drinks including still (tap) or sparkling water, juice, and possibly coke or diet coke. Don’t ever let a glass stand empty. Never expect anyone to have an alcoholic drink to ‘join in’. But also refrain from criticizing anyone for drinking too much (unless they are being sick!). Keep drinks—water at least, on the table. Check with guests for allergies and likes/dislikes before you start planning. Make an effort to make the room look inviting and interesting—the dinner party is an experience of the senses, not just food or conversation but also of sound and vision. Don’t play music so loud that you can’t have a conversation. Seating place cards are not necessary, but may be useful for the larger groups. No one will expect them. The usual seating plan is male/female. Whether you serve your food in dishes in the middle of the table or place the food on the plate in the kitchen and bring the plates into the dining room to set in front of the guests is entirely up to you. The type of food you’re serving will most likely determine this. A relaxed host will make up for any other negatives. People want to have fun and they will overlook most things but they will not have fun if the host is tense or anxious! Yes, as a Brit I agree with all of that, but how does it work in reverse? I have yet to be invited out to a dinner party in the U.S. and if I was, which seems ever more unlikely! I would like some guidelines as to how to behave and what to expect etc.